Bluetooth technology has become a standard feature in many new cars - and for a good reason. 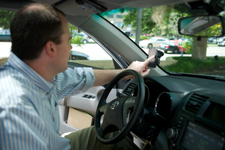 The technology offers drivers a convenient and potentially safer way to manage phone conversations while driving. Not only is it more convenient, in some states and localities it may be your only option for talking while driving. The technology is great for making and taking phone calls, but you may not know that it’s also a convenient way to listen to your favorite music in the car. Just like phone calls, you can play music stored on your phone (or any portable device that supports the "A2DP profile" for Bluetooth streaming audio) through your car speakers. If you have a vehicle manufactured in the last few years, it may already support Bluetooth hands-free calling and may also support Bluetooth streaming audio. But what if your car doesn’t have Bluetooth? Or what if you want to add Bluetooth streaming audio features to a new car? Thanks to your local automotive electronics retailer, you have a wide variety of options. Portable Bluetooth Speakers are a simple plug-and-play solution for adding Bluetooth functionality to any car. 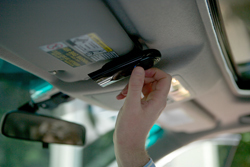 They feature built-in speakers and microphones to let you take your cell calls hands free. Relatively small, they usually attach to your car's sun visor, much like a garage door opener. Most contain built-in rechargeable batteries and can also plug directly into your 12V lighter outlet for powering or charging. Most models feature only a few buttons, which makes operating them simple. Some offer small screens for displaying caller ID and call status. Models with built-in FM transmitters give you the additional options of hearing your calls or music through your car stereo over an unused FM station. Universal Bluetooth adapters are another great option for connecting your mobile phone or other device to your car radio. These small devices plug into your car's AUX jack using a standard 3.5mm stereo audio cable. Adapters are an easy way to add Bluetooth streaming audio functionality to a newer car. More sophisticated car kits can be installed (hard-wired) into your vehicle, which offer several advantages. For starters, installed car kits offer an integrated look with no dangling power cords, speakers or microphones. Second, they are connected to the vehicle's power supply, which means you never have to worry about remembering to charge them. Also, many car kits can be configured to mute your car's sound system when your phone rings or you initiate a call. Depending on how many incoming calls you get, this can be a huge convenience. Some models also speak caller ID, which lets you keep your eyes on the road while trying to figure out who's calling. Finally, most car kits support Bluetooth streaming audio. Ask your installer about vehicle-specific solutions for fully integrating a Bluetooth adapter or car kit with your factory-installed or aftermarket stereo. Many portable navigation devices (PNDs) offer built-in Bluetooth for calling and music streaming. Like the solutions mentioned above, PNDs with built-in Bluetooth use either their built-in speakers or an FM transmitter to play your calls through your car stereo. Using a Bluetooth-enabled PND can be convenient as it minimizes the number of gadgets in your car and integrates calling, music playback and navigation into one unit. You have a lot of options when it comes to adding Bluetooth to your vehicle. Whether you want to listen to music wirelessly or your state or locality mandates hands-free talking while driving, you’ll definitely want Bluetooth technology in your car. Make sure your phone is Bluetooth-enabled in order to be able to make and receive calls using a hands-free device. Also keep in mind that if you wish to stream music from your phone or portable music player, both the phone/player and the radio/car kit/PND must support the Bluetooth Stereo (A2DP) profile. A mobile electronics retailers can help you determine whether your current mobile phone is right for the job. Remember, there's no device that can substitute for common sense to keep you safe on the road. Please use cell phones and hands-free devices with caution and always keep your eyes on the road. To find a retailer and MECP-certified installation technician near you, type your ZIP code into the search box at the top of this page. A portable Bluetooth speaker is a quick way to add Bluetooth functionality to any vehicle. Using Bluetooth to stream audio from your phone gives you wireless access to all of your music.